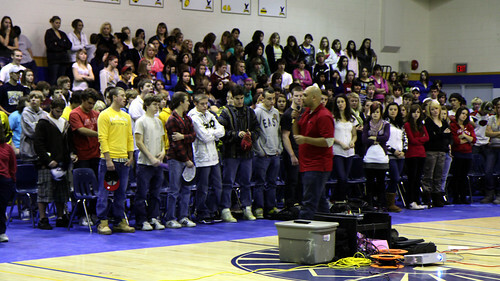 Rahul DCunha has DHS Students stand to demonstrate the impact of drunk driving accidents. The Mayor’s Committee for the Prevention of Substance Abuse brought a presentation by Mothers Against Drunk Driving to DHS on Wednesday. Rahul D’Cunha began by leading the students through some drunk driving statistics, telling them that on average 207 people are injured or killed by drunk driving in Canada every day. He also did a striking demonstration of the effects of drunk driving accidents, by having students stand up to show just how connected they all are. D’Cunha hopes that the tour, which will result in over 1 million students across Canada seeing the presentation, will cause students to stop and think about the message that it delivers. For more information, or to see clips from “Wasted”, go to www.madd.ca.